Indonesian YellowKies Cellebrate 21st Anniversay -Sechkies was debuted in April 15th 1997. They were first generation of KPOP who gain succesfullness and created idol culture in Korea. After disbanded, they were grouping again and joined YG Entertainment on May 10, 2016. 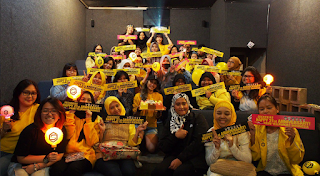 On the April 15th, Indonesian Yellowkies cellebrated Sechkies 21st anniversay in Jakarta. They were watching toghether while using yellow outfit and bring Sechkies lighstick. They were really enthusiastic and support Sechkies till the end. Thankyou Indonesian Yellowkies, you are great fandom in the world. Hope you keep supporting and loving our oppas.